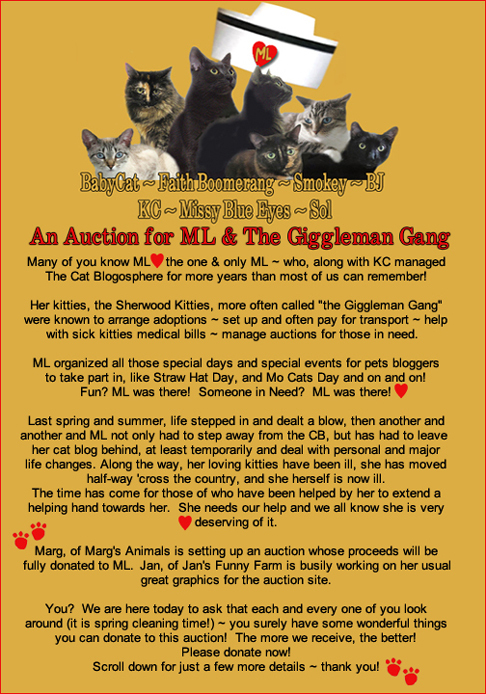 Please, if you have anything to contribute, contact Marg, she will be glad to add it to the auction. Mom donated a gift certificate for 4 distance healing reiki sessions, so if you ever wanted to try it, please bid. Best purrs for ML and the whole Giggleman Gang! Thanks for your patience as mommy was scarce while prepping for passover and not visiting blogs. We think it should be called pass-OUT cuz mommy sez she's never been more tired in her life (3 whole days of cooking - oy!). Who killed the Bunny Kicker?